Welcome to the Charlestown History website. What you see on this website is the results of about ten years work - visiting archives, interviewing local residents and digging up new photos. If you like the site, add it to your favourites and visit it again. The group was set up in March 1998 with the aim of finding out the history of our 'own backyard'. None of us were experts, but we knew that we lived in a fascinating corner of West Yorkshire in the UK. 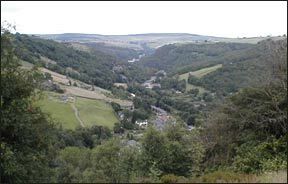 The group disbanded in November 2011and the website is now kindly owned and hosted by Hebden Bridge Local History Society. If you have any questions or want further information about anything on the site you should use the Queries section of the Hebden Bridge Local History website (there is a small charge for this service). If you are interested in doing any research on the locality or have information or photos, please contact them by email (you can use the following email link) Hebden Bridge Local History society. Where we are tells you where Charlestown is and what its like. Eastwood Home page takes you to a whole section on Eastwood, which is to the West of Charlestown. About the group tells you about who we are, what we are trying to do and some of the sources of information we have used. Talk to us invites you to add information, ask questions and tell us what you think of the site. Archive is where we keep very detailed information that may be of interest to specific people. Eastwood Residents Association who helped us develop theEastwood pages. Why was it called Charlestown? We still don't know. Where were the Charlestown Tea Rooms? Someone researcing their family tree concludes that "the proprietoress may well have been Caroline Moss who was married to William Wheelhouse Moss . The Wheelhouse came from his mother Martha Sarah's maiden name, Wheelhouse - all born in the Wadsworth area. The Wheelhouses were the cartwrights of Hebden Bridge. How he came to have a tea room (or where it was) is a puzzle - he is part of the Moss family who had the fustian/dyers at Brisbane Mill on the Todmorden side of Eastwood and is listed as fustian employer in 1881".